Our Vernon Roof Cleaning and Moss Removal Service is vital for any home or business. Regular maintenance on your building’s most essential protective measure preserves its outward appearance. It also extends the service life on a part of the structure that is one of the most costly to replace. The main reason to call in the professionals to carry out Vernon Roof Cleaning and Moss Removal is, of course, safety. Over the years, countless people have fallen off roofs due to improper practices. Roofs are not only steep but exceedingly slippery when wet, and coated in cleaning solutions. Even the experts have moments where their lives (or, in the case of our skilled Gorillas, bananas) have flashed before their eyes. That’s why Gorilla Property Services is a proud member of WORKSAFE BC, and safety equipment maintenance is performed prior to commencing any project. There are certain conditions under which moss flourishes. Trees that overhang your roof are an ideal method of transportation for moss spores. Moisture, which is unavoidable in British Columbia, accelerates the growth. And when your roof is covered in leaves, needles and other debris; that moisture is retained for longer. Not only will your roof look terrible, but the damage can be pricey. Say, for example, your Vernon property is equipped with asphalt shingles. As moss thickens and grows it can lift the shingles. This allows water to access and rot the decking ultimately causing leaks. In heavy winds, those raised shingles could be torn right off the roof. Property owners have been known to lose up to 40% of the life expectancy on their roof due to lack of consistent maintenance. 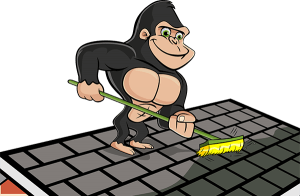 With Gorilla Property Services’ Vernon Roof Cleaning and Moss Removal, you needn’t be one of them.